I kicked off the Bring Your Own Device (BYOD): A Summit for Decision-Makers (summary article) as the keynote speaker last week in Ann Arbor, Michigan. 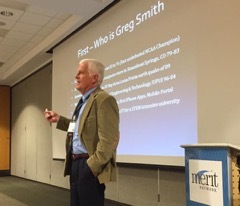 This Summit was put on by Merit, who provides the network service needs of higher education, K-12 organizations, government, health care, libraries, and other non-profits for the state of Michigan. It brought together public and private sector technology and security leaders, as well as experts from academia and a wide array of vendor sponsors, to discuss hot trends for employees who are bringing their own devices to work. I was interested in presenting on this BYOD topic because I understand the concerns but I also feel we need to put the issue into proper perspective. BYOD is officially defined as the practice of allowing the employees of an organization to use their own computers, smartphones, or other devices for work purposes. This is the valid concern which causes us to question our preparedness for dealing with bandwidth and security issues associated with BYOD. But the acronym has become synonymous with challenges relating to the explosion of mobile internet access devices which tend to pressure our network management more than security risks. My Keynote entitled, BYOD: We just need to keep up, focused on the emerging concerns from Wear Your Own Device (WYOD) and the evolution of The Internet of Things (IoT). Wearable devices today are not really pressing our infrastructure or security concerns, however, that is the calm before the storm. The focus for these wearables today typically points to some form of activity or health monitoring. Interaction with the Internet or local WiFi is minimal now typically because of power consumption issues. However, the stage is set for these small useful devices to interact with our personal Internet space. And the most significant use will evolve out of the NFC based authentication made popular by the Apple Pay entry for transacting purchases. The key here is the validation of mobile devices, typically today’s smartphones, as authenticators of our personal identity. Replacement of the credit card swipe for retail purchases will lead the way, however, we in IT will get to explore and support all of the other uses that will play off this technology. For us in higher education we will see this become our student’s ID Card for building access, attendance and even remote test proctoring. The technology challenge is not daunting, however, the shift of our support mentality may be difficult. We will need to protect the effectiveness of these activities along with ensuring the security. It will mean a lot more technology responsibility on our plates. I was chatting with one of our professors and our conversation ventured into the importance of mobile devices. The topic related to why it was so important for Microsoft to gain a foothold in the mobile phone market and I explained to him the intricate connection between the consumer’s phone and their computing platform of choice. But I also told him that the mobile phone would someday be the most important component for authenticating identity which is critical for financial transactions. I’m not sure I knew exactly how that was going to play out but it is always fun to stimulate non-techies into imagining what the future might hold. I did tell him about how important cell phones were in Africa for providing a means of transferring money. So it was a natural assumption to connect the cell phone to the online or digital economy as a means of providing more secure form of authentication. And when you talk more secure you typically relate that to a dual form of authentication based on something you have and what something is better than cell phones. Anyways, this conversation led to being asked to give a talk on this topic for the local Rotary. I relate this conversation as a lead in for the story today about how Apple might offer a means for how we pay for stuff. Apple is hinting that it may explore this territory of payment services and that the fingerprint authentication on the new iPhones was implemented with this in mind. But the real impetus may be that Apple has amassed the most impressive number of personal accounts, about 800 million, that are connected to a credit card. This number is huge especially when compared to the next closest, Amazon’s 237 million. And what was the trick to getting this many purchase ready accounts? Music Downloads through iTunes. Yes, the convenience of impulse buying for a song that I hear justified my synchronizing my credit card with my iTunes account. And I have been very pleased with the results; quick, efficient, receipt email, and trust. Yes trust, there has not been a significant security breach of Apple’s accounts. So is Apple going to expand their payment services to include any online or even checkout counter transactions? Lot’s of issues that have to be worked out before that financial model is justified, but I would bet on it. I was originally thinking the mobile phone could provide an identity solution for verifying who you are using the 2 step authentication model. Apple has successfully expanded that to include biometrics which I think will inevitably be required in our insecure identity compromised world. Makes a whole lot more sense then offering a credit card and signing a receipt. Needless to say, control of the mobile phone market continues to grow in importance. The next authentication phase will probably involve scanning that chip they want to insert into our body, but I think for now we work from something that everyone wants to have on their body. I am about the same age as Steve Jobs and in many respects we did grow up together at least with our involvement with technology. He obviously was a bit more involved which was good because that had a significant influence on me. I was supposed to be a doctor but realized that was not my real dream however, I did get a degree in Chemistry out of it. As a chemist I discovered “computers” or powerful calculators that controlled analytical instrumentation in the laboratory. Yes, college courses introduced me to computers that you interacted with via stacks of paper cards but the concept of creating something on your own computer just totally grabbed me. I then heard of these personal computers like Heath Kits but it was the discovery of a ComputerLand store in Chicago that did me in. This is 1979, an Apple II computer emerging and I had to have it. The serial number was 2014. So began the journey that placed me very much in tune with what Jobs and Wozniak were up to. Owning my own computer at that time was amazing. At this time in my career as a chemist I just happened to be making a lot of money, at least for me, due to working through a strike situation with my job. In late 1979 I convinced my college buddy who had just graduated with an MBA and Law degree to partner on starting a computer store/software business. Jobs and Wozniak we were not but what a great adventure, start a computer business with about $10K in Steamboat Springs, CO. Maybe the location doomed ultimate success, but the adventure was real. Programming on an HP 85 actually was my best option for the lab management software I was developing but Apple was a part of our lives. Well this is a just a teaser for my life growing up with Steve. There is a book in this but the story is still evolving. I did actually run into Steve at the Frys in Milpitas back in 1987. As I remember there was a NEXT facility nearby. I have gone through the Apple roller coaster of love, confusion, pity, and amazement. Yes Steve was amazing and Apple Inc. is an impressive portion of his epitaph. I do feel fortunate to have lived during the life of one of the greatest people of all time. I confirmed a couple of things at mLearnCon this week in San Diego. Mobile Learning for Higher Education is about connecting while for the business community it is about information delivery. Since the concept of mobile learning has evolved due to improved mobile devices, Higher Education has been expected to blaze a trail for incredible new mobile learning tools. And we have tried, ambitious educators have siphoned off many grant dollars to explore the possibilities. We at GFU have been in the middle of it with many early Apple iPhone, Touch and now iPad applications, but we were not finding mobile learning. We were finding mobile connectivity and more flexible access to information but that did not translate into improved learning. The learning would have to come from a change in pedagogy, as William Rankin, ACU Connected, most effectively explained it, our professors need to present the questions that our students can now easily research, then help them experience and discern the answers. Mobility unlocks the classroom allowing us to directly answer the questions. And with everyone connected; directly can mean virtually or directly as in leave the classroom to explore the question in person. This is incredibly exciting but also frightening to academic institutions that are comfortable with the reverse. Now there may be a refuge for our faculty who find greater comfort as conveyors of information. That would be to go to the private sector and help the many business entities that need to use mobile learning to more effectively educate their employees or customers. I discovered an excellent example for the use of mobile learning for the corporate world, it was presented as “Digital Wine“, by Robert Hennigar, of Constellation Wines. His education department has created the perfect mobile learning application, Academy of Wine. Condense the necessary information about every wine that they sell and make it readily available to their employees, distributors and anyone else who might need to offer an intelligent recommendation for a wine. I recommend that you checkout the mobile site, http://www.aowmobile.com, if you ever need to make an important wine selection. I probably should be posting everyday if I wanted to keep everyone up-to-date on the many discussions and issues circulating around our investigation of the iPad as our university’s recommendation for a student educational technology device. But I took 5 days out to celebrate my dad’s 95th birthday and now the SuperBowl will require some attention. Go Colts. So a quick update – the excitement that the iPad has generated was summed up well by our President who was in Washington DC during the Apple iPad event where he observed that the iPad announcement received more media attention then the State of the Union Address. Many who fear the change that the iPad will bring have argued for what it can’t do. Here is an example: “but it does not do handwriting recognition” or “it does not have a camera”, “it does not multi-task”, etc. So let’s be clear – the iPad is not a Tablet, or Laptop, or iPhone. It is an iPad and it is not intended to be like anything else, it is a NEW and innovative technology. Many play the skeptical role questioning whether it will be successful and they are content to wait and see. I say the iPad has no risk of failure, worst case it will be successful if nothing more then as a replacement for our love affair with having a morning newspaper. There is a reason why the book publishers are embracing the iPad and this is different from the music industry and the iPod. First, the music industry did not see or understand what hit them. Second, the iPad comes in as the second or third generation eBook reader that solves most of the problems. Third, the business concept has already been defined and Apple is not the enemy, Amazon and Google have been. So I need to allocate enough time to fulfill my obligation as a die hard Colts fan this weekend and then I have to present a proposal to my university for why I believe the iPad would be a more effective education technology device then the current MacBook that we give to our students. However, the iPad has no chance of winning that role without the support of our faculty to leverage the iPad’s technological advantages in the classroom and on campus. Will the iPad change Higher Education? After my initial observation of Apple’s new iPad I do believe it will change how we define a student computer. Here at George Fox University we have a more unique opportunity to represent this since through our Computers Across Curriculum, CAC, (undergrad laptop program) we have defined a student computer for the last 20 years. Generally that definition has been based on various software requirements set forth by our curriculum. But that type of justification was based on applications that resided on the computer that produced output such as documents or spreadsheets held hostage by proprietary formats or feature sets. The iPad can change that. The iPad is not dominated by an operating system or major applications. No it is dominated by user design for the most flexible and effective interaction with the Internet. It is a device that was designed for our computing preferences rather then to determine our computing practice. I do see our university replacing our CAC laptop computer with this new iPad as our recommended educational computing device. That may mean that we leave some needs on the table, students may need another computer or we may need to reinvest in some public computing. But the resource that we can make available to our students with this iPad probably equates more closely to the computing world they live in. Writing will transition from print to electronic publishing and maybe accounting will be more about teaching spreadsheet concepts and less about teaching Excel. So I’m feeling good about embracing this iPad. I believe higher education will be the benefactor of a much needed change in computing strategy. This post is to applaud Apple’s marketing strategy. They have truly parlayed the art of competitive silence into the most effect marketing strategy a company could ever hope for. The iPhone set the stage for this and carrier agreements somewhat justifies it. Pretending that the silence is for strategic protection is brilliant. I love the Apple employees who do actually buy into this completely, kind of an oath of operation. But the result is an immense amount of free advertising based on anticipation. Who had the greatest impact at the CES last week? The company that was not even there. Aren’t we all anxious about what Apple might announce on Jan. 26th or 27th?